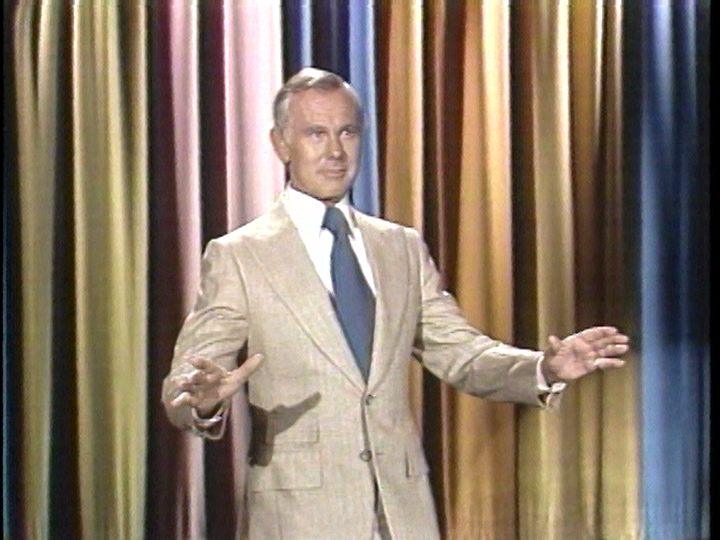 As an infant, I would take my evening bottle while watching Johnny Carson on The Tonight Show, the late-night talk show featuring celebrity interviews and performances that became the template for most that followed. (This is based on what my parents have told me, not some crazy early memories.) I don't have any particular loyalty to his version of the show, and have very little knowledge of the series outside of the basic pop-culture knowledge (powered mainly by imitations and parodies of Carson.) I definitely was not a fan of Jay Leno's era, finding it too bland for my tastes, and though I like Jimmy Fallon (an extremely nice guy in-person), I've stopped watching his show, which is too dependant on games and bits at this point. So the opportunity to revisit Carson is one I approached without much bias. A few things become immediately apparent in watching the 12 somewhat-randomly-selected yet seemingly uncut episodes from the ‘70s that make up this collection (half of the larger 12-disc Vault Series.) First of all, Carson had some truly awful writers. It's incredible the amount of times he straight-out bombs with terrible monologue jokes, to the point where the audience actually boos him. Almost all of the prepared bits, be they sketches, like his scene with a mobster getting audited by the IRS, or scripted segments, like a list of split billboards or his psychic Carnak bit, are brutally unfunny. For a man who has a reputation for being extremely hilarious, it's painful to watch him struggle with the material he's given to work with. However, it's also a testament to Carson's clever wit and natural charm, as he could overcome even the weakest line with a quip that would bring the audience back to his side. 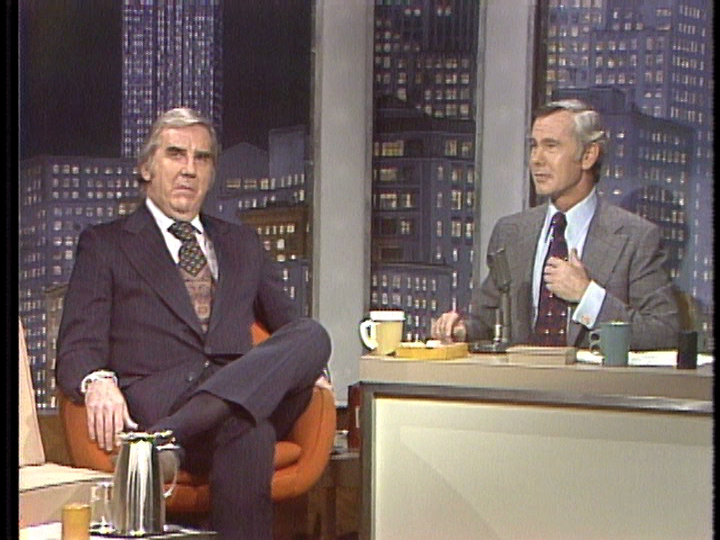 Carson off the cuff was Carson at his best, which was highly evident in his banter with his sidekicks, like announcer Ed McMahon, with whom he would get into combative banter, and bandleader Doc Severinsen (who was pretty quick in his own right.) The show had that feeling of a group of friends hanging out and having a good time, like a televised cocktail party, which may be why the show was never more enjoyable than when it would go off the rails and Carson would barely make an effort to correct course, enjoying the chaos as it unfolds. For as interesting as the show can be in the interview segments, there's absolutely nothing more fascinating in this collection than the commercials between segments (the two national ads of each break from the original broadcasts have been retained.) 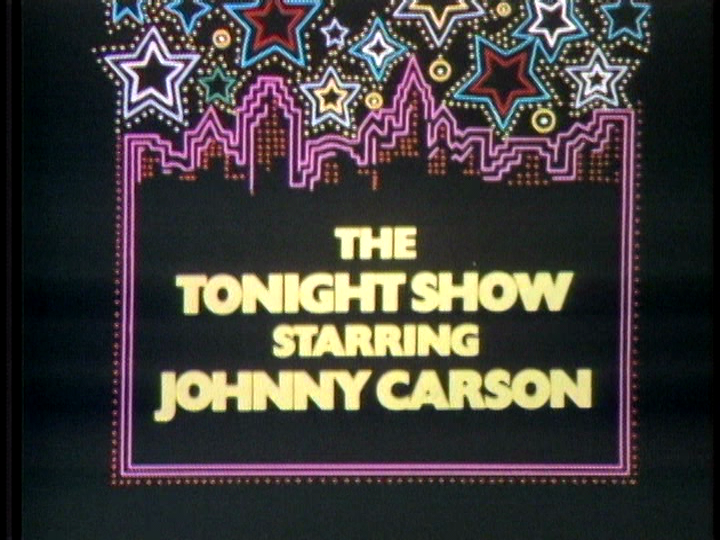 Aside from the old-style seques from Carson and the "live" reads by McMahon (which have been combined at times on Fallon's version of the show), the content of the commercials is the most dated element of the whole collection. It would seem that housewives were the core audience of the show, as they were often for cosmetics and household products, and usually featured women with no concerns outside of those two areas (like the commerical for the Lady Kenmore dishwasher, which gave women more freedom to do important things, like make a cake for her husband. A surprisingly high number of the ads are for products that are still relevant today, but there are quite a few for products that are long forgotten--like Pillsbury's Figurines diet snacks--and are all the more interesting for it. For someone who grew up on the syndicated re-run television of the ‘80s, B-list ‘70s celebrities like Shecky Greene, Charlie Callas and James Coco were familiar faces, even if the reasons for their fame weren't readily apparent. Younger viewers may not find some of the people interviewed quite as intriguing though. That said, there are quite a few who transcend time, including candid author Truman Capote; actors like James Garner, Gene Kelly, Stockard Channing and Tony Randall; animal expert Joan Embry and her menagerie of adorable and potentially fearsome creatures; nutty (yet talented) drummer Buddy Rich; comics like Andy Kaufman, Richard Pryor, Rodney Dangerfield, Robert Klein and David Brenner; as well as a pre-Wonder Woman-fame Lynda Carter, whose struggles with sexism are clear in retrospect. That said, an in-depth knowledge of, for example, Roy Clark's work isn't exactly necessary when Carson's the one steering the ship. The 12 episodes in the Vault Series Archive Classics are spread over six DVDs, which are packed in a double-width keepcase with three dual-hubbed trays for the discs, along with an insert featuring a list of the content included. The order makes next to no sense--guided, per on-disc disclaimers, simply by disc space. The discs feature static full-frame menus offering options to watch an episode--with or without commercials (but why watch without?) --and check out the extras. There are no audio options, and no subtitles or closed captioning. These full-frame episodes certainly look their age, the result of their origins as a show shot on videotape in the ‘70s. There are disclaimers in several spots on these DVDs indicating that the quality of the video, which at times features drop-outs, tracking issues and harsh splices, is the best possible, due to a lack of good source materials. Overall, you're getting that harsh look of ‘70s video, with the garish color and soft, detail-light image, as well as some issues with pixelation on hard edges. It's not great, but it's not likely getting any better either. The audio, delivered via Dolby Digital 2.0 tracks which copy the show's mono sound to two channels, is simple and clear, allowing voices to come through cleanly, while music sounds solid, with decent weight. Any issues with volume or clarity, like the muffled sound in a Lavoris mouthwash ad, look to be a problem with the original production. It's not a flashy mix in any way, but it will do. Each disc features a bonus clip, running between 16 and 21 minutes (for a total of over 117 minutes of bonus footage.) 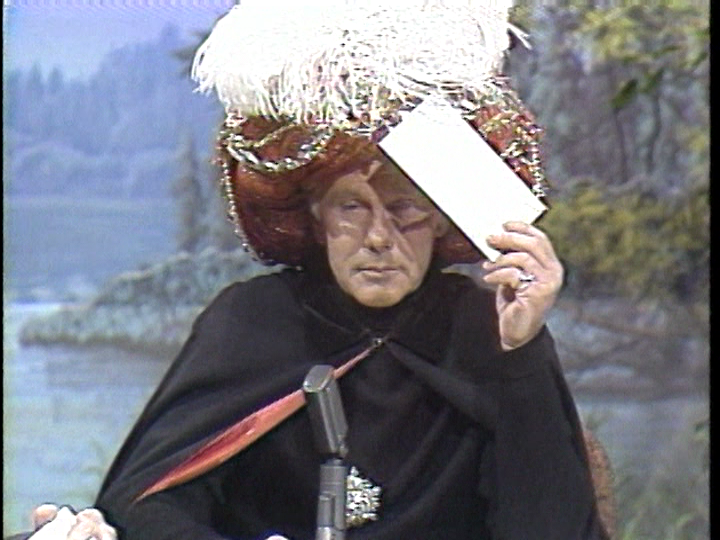 Most of them consist of just an episode's intros and monologue, which is a real disappointment when it mentions a great guest, like Liberace or Charles Nelson Reilly. Some of them feature bits, like Carson reading from a list of non-bestsellers or him getting a massage from a Swedish masseuse, when interviews would have been far preferred. The real gem, however, is seeing Carson do a cooking demonstration (using a dishwasher) alongside the great Vincent Price. A more unusual segment there may never have been. While the true appeal of this release is to anyone remembers Carson's run on The Tonight Show or the celebrities he interviewed, there's a time-capsule aspect to these episodes that rises well above nostalgia into something sociological. Though it takes a while to get through 12 episodes, watching more would be a welcome treat, if only to see a master conversationalist at work. Thanks to a lack of quality source materials, these episodes look and sound as good as they likely ever will, while the bonus material is reasonably plentiful, but focuses on the show's weakest points. Whether you lived through the ‘70s or are just curious about them, this set will satisfy.